Paper is an indispensable part of everyday life. Beyond its use as the basic material for written and printed communication, paper in its various forms are used for hundreds of other purposes, including packaging, wrapping, insulating, and toweling. Each year, Americans use an average of 750 pounds (340 kilograms) of paper products per person. 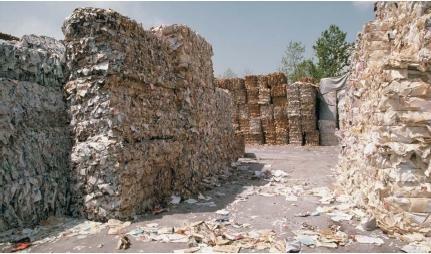 That equates to 210 billion pounds (95 billion kilograms) of paper products used in the United States per year. The word paper comes from papyrus, a reedy plant that used to grow abundantly along the Nile River in Egypt. Centuries ago, ancient Egyptians removed the fibrous layers from the stem of this plant and cemented them together to create a durable woven writing material also known as papyrus. Examples of papyrus manuscripts have survived to the present. Many sources claim that paper (as we know it) was first invented in A.D. 105 by Ts'ai Lun, a Chinese court official. Historians believe he mixed mulberry bark, hemp, and rags with water, mashed it into a pulp, pressed out the liquid, then hung the thin mat on a mold of bamboo strips to dry in the Sun. 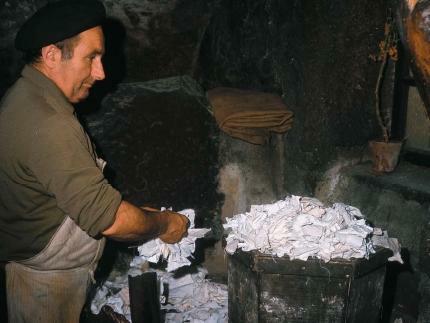 Paper made from rags in about A.D. 150 still exists today. By the early seventh century, paper and its production had been introduced into Japan. From here, it spread to Central Asia by 750. Paper did not make its way into Europe until about 1150, but it spread throughout the continent over the next few centuries. Rags were the chief source of paper fibers until the introduction of papermaking machinery in the early nineteenth century, when it became possible to obtain papermaking fibers from wood. Calendar rolls: Highly polished metal rollers used to compact and smooth paper after it has dried. Cellulose: An insoluble carbohydrate that plants use as building material to make their cell walls. Deckle: Frame around the edges of a mold used to make paper by hand; also, either of the straps around the edge of the screening of a papermaking machine. Fourdrinier machine: Machine that forms paper from pulp, named after the English brothers who financed its development in the early nineteenth century. Today, paper can be both handmade and machine-made. Both types of paper consist of tiny cellulose fibers pressed together in a thin sheet. Each of these fibers is a tiny tube, about 100 times as long as it is wide. Today, most fibers come from wood, though in earlier times, the source was more likely to have been rags of linen or cotton. The source material is reduced to a slurry of fibers that float freely in water, and many of the fibers will have been broken or cut when making the pulp. When the water is removed, the fibers form a thin layer of pulp that eventually becomes paper. Rags to be made into paper are first sorted, and any unsuitable ones are discarded. Seams are opened and items such as buttons are removed. The rags are chopped into small pieces, which are then boiled in strong cleansing solutions. Next, the pieces are rinsed and beaten while damp until all of the threads have disintegrated and the fibers float freely in water. This is the paper pulp. The very dilute pulp is next sent to the vat where the paper will actually be made. A rectangular mold containing wires running at right angles to each other is used to make a film of the pulp. Traditional molds have thin, closely spaced parallel wires running across the mold at the surface. These are attached to thick, widely spaced wires beneath them that run perpendicular or in the opposite direction. Paper formed on this type of mold typically reveals a ladder-like pattern when held up to the light, and is known as laid paper. Woven paper is formed on a mold of plain, woven wire screening. Thin wire forming a design may be attached to the mold's surface wires to produce a watermark in the finished paper. A rectangular frame, called the deckle, is placed over the mold to convert the mold into a sort of tray. The papermaker then dips the mold with the deckle attached into the vat of dilute pulp and draws up a small amount of pulp on the surface of the wire. The mold is then shaken and tilted until most of the water has drained through the wire. The deckle is removed, and additional water is allowed to drain off. A second worker takes the mold and transfers the film of pulp to a piece of damp felt, laying a second piece of felt across the top. water. Then the paper and felt are separated, and the paper is pressed by itself and hung up to dry. When dry, the paper sheets are dipped in a tub containing gelatin or very dilute glue and dried again. This gives the paper a harder and less absorbent finish than it would otherwise have had. All paper was made by hand until the early nineteenth century. Artists use most of the handmade paper produced today, although many other people believe it to be the finest printing surface available. Hardly any paper for book printing is made from rags today. Wood is the main ingredient of paper pulp, though the better papers contain cotton fiber, and the best are made entirely of cotton. The fibers are converted into pulp by chemical or mechanical means. Chemical pulp is used to make fine white paper, whereas mechanical pulp is used to make newsprint, tissue, towel, and other inexpensive papers. Chemical pulp begins with the debarking of logs. Chippers with whirling blades reduce the logs to smaller and smaller chips. The wood chips are then boiled in a large vat called a digester that contains strong caustic solutions that dissolve away parts of the wood that are not cellulose. This leaves only pure fibers of cellulose. The machine that converts either type of pulp into paper is called a fourdrinier machine, after English brothers Henry and Sealy Fourdrinier, who financed its development in 1803. The fourdrinier machine takes pulp that is almost 100 percent water and, by removing almost all the water, changes it into a continuous web of paper. Watery pulp enters the fourdrinier machine on an endless moving belt of nylon mesh screening. As it moves forward, the screening is agitated from side to side to drain the excess water. Deckle straps prevent the liquid pulp from slopping over the sides. Air suction pumps beneath the screening also pull more water through. As the pulp passes along on the belt, a turning cylinder presses on it from above. This cylinder, called a dandy roll, is covered with wire mesh that imparts either a wove or a laid surface to pulp, depending on the pattern of the mesh. At the end of the fourdrinier machine is a series of felt-covered rollers. As the pulp (now very wet paper) passes through them, they press still more water out of it, condensing the fibers. The paper then passes through sets of smooth metal press rollers that give a smooth finish to both surfaces of the paper. 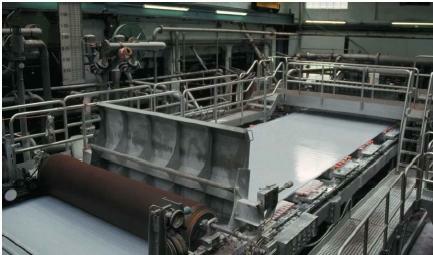 The drying process is completed after the fully formed paper passes through a series of large heated rollers. Once dried, the paper undergoes calendaring, in which it is pressed between a series of smooth metal (calendar) rollers that give it a polished surface. Afterward, the paper is cut into sheets or wrapped into a roll. I had got a very good information regarding paper.can I get some useful tips about cardboard making & machinery used in making it.